Alabama Bloggers: Birmingham Restaurant Week: Chart Your Course. It is time to break your piggy banks, count your change, and plan your schedule. The ten day celebration of Birmingham's foodie culture is upon us. If you have yet to discover the local restaurant scene in Birmingham (and don't feel bad - it took me years as well), then this is your opportunity to widely sample the best that Birmingham has, and at a discounted price. You will discover the special touches of our local chefs and restauranteurs that make your dining experiences at their restaurants make you feel like you're in a favorite family member's home. The festivities begin on August 15 with the Preview Party. This is one of our favorite events every year, because we get to eat at many of our favorite local restaurants in one fabulous meal. And then, starting on August 17, The Main Event Begins. So trust me. 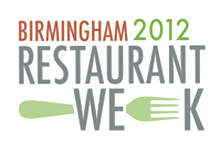 Go to the Birmingham Restaurant Week website. Drool over all of the fantastic menus posted by Birmingham's best restaurants. And chart yourself a food tour that you will never forget. Plan an epic date night - one more affordable than it would usually be - at Hot and Hot Fish Club, Little Savannah, or Veranda on Highland. Take the kids out with you one night, where they will be awarded with their own specialized Restaurant Week menu - at Nabeel's Cafe, Jim N Nicks Southside, or Silvertron Cafe. Grab a $5 lunch during the workday - at Maki Fresh, Rusty's Bar-B-Que, or Ted's Restaurant. Go out with friends for a casual dinner - at Little Donkey, La Paz, or Billy's Sports Bar and Grill. Those are just some ideas - there are dozens more dining options, just waiting to be explored. I'll be blogging about our Birmingham Restaurant Week adventures, and I hope to hear about yours as well!